A couple months ago, the newspapers that make up the Los Angeles Newspaper Group declared that this would be the Summer of Cycling. 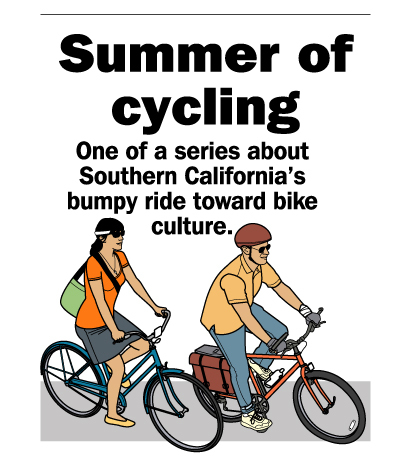 The parent company of the Daily News, San Gabriel Valley Tribune, Long Beach Press-Telegram, et al, promised an in-depth look at bicycle culture, laws and customs, traffic enforcement and the future of bicycling in the City of Angels and surrounding communities. But two months later, they still don’t appear to have even spoken with the city’s many bike advocates who know the streets and issues best. Let alone the city officials charged with remaking our streets to accommodate all road users. Instead, they’ve relied on an out-of-touch futurist to say no one will ever ride to work around here in the years to come, while trolling for comments from angry motorists. Along with an editorial board member who seems to have surprised himself with a pleasant commute from South Pasadena to Downtown LA. Now they’re at it again, using a quote from John Forester, the father of Vehicular Cycling, to set up a discussion of whether bikes belong on the streets — obeying all the rules, of course — or separated bikeways. Even though they seem to get Forester all wrong. He’d no more support bike lanes — which he considers dangerous, despite all evidence to the contrary — than he would a full conversion to enforced segregation on Dutch-style cycle tracks. And the way the question is posed, it’s likely to draw as many comments from bike-hating motorists demanding bicyclists stay off the roads until they get a license, stop running red lights and pay for their own bike lanes as it is to capture considered comments debating the actual question. Is Los Angeles better off continuing to stripe bike lanes, or should the city invest in separated bikeways, despite the much higher expense? Or do nothing at all, and let riders continue to fight it out, Forester style, on often unwelcoming streets? And what do you think about LANG’s self-ballyhooed Summer of Cycling? CVC 21202 and 21208 should be abolished for being redundant in light of 21654 and 21656. CVC 21654 should be enforced better. Because the normal speed of traffic is the median speed at that particular time and place, if you’re among the slower 50% of vehicles on the road, you’re legally required to drive in the right lane according to this law, and this implies passing on the left. However, the law is usually misinterpreted to apply to only those vehicles that are moving substantially slower than the rest of traffic, by some subjective measurement of “slower”. With the above corrected, police would stop ticketing bicyclists for “impeding” traffic (it isn’t really impeding if traffic can change lanes to pass), drivers would get into the habit of passing on the left as they do in Europe, and the issue of whether to build bike lanes, separate bike paths, or nothing, would become much less important. Bike lanes and bicycle boulevards where needed, protected bike lanes where necessary. The real question is what kind of bicycle city does Los Angeles want to be? Does LA want to grow bicycling and embrace the best practices detailed in the NACTO Urban Bikeway Guide, following the lead of New York, Chicago, San Francisco, Seattle, and dozens of other cities that have overhauled their automobile-centric design standards? Or does LA want to go the easier route and appease the most dedicated cyclists with token bike lanes without disrupting the primary objective of moving automobiles? This is a question of priorities–not cost. Most of the time, protected bicycle lanes only require paint and perhaps some soft hit posts, or they are rolled into a full streetscape redesign that is already occurring (such as Rosemead Blvd in Temple City). For my personal opinion, I think we are best served by getting as much built as possible as quickly as possible. That means on street lanes, buffered where possible, and separated where it can be done at minimal expense. Completely separate facilities like the river paths are nice, but should be considered (and funded) as recreational facilities, not part of the transportation infrastructure. If the slower vehicles stay to the right, and faster vehicles stay to the left, then it will be safer for bicyclists because faster traffic will stay further away. This is one reason why the Autobahn is safe despite a large difference in vehicle speeds. Yes, I understand the concept of passing on the left and am familiar with German autobahns. I just don’t see how this really applies to the bike problem. Cars will almost always pass a bike on the left already because that is where there is room for them to go. And the rules for multi-lane highways don’t necessarily apply to a single lane road anyway. I’m just not understanding why we wouldn’t need bike lanes/path just because cars pass on the left more consistently on multi-lane streets. It’s safer for bicyclists when cars pass other cars on the left than when they pass other cars on the right. I have always seen this as a two step process: stripe bike lanes to create important arterial connections. Then, once people have become accustomed to the painted bike lanes, make them permanent by converting them to cycletracks. Seems like a no brainer to me. Where I live (San Gabriel Valley) there is so little bike infrastructure that I cheer at the sight of any new bike lane, and would be ecstatic to see a cycle track anywhere. As for the LA News Group’s “SOC” series, I rate it an “epic fail.” The entire series betrays an utter ignorance of what it’s really like to commute by bike in Southern California, let alone what infrastructure changes will be necessary to increase cycling’s mode share to groups of Southern Californians who don’t already see themselves as “cyclists.” The entire series suffers from a barely concealed sneer at cycling advocates, and utterly fails to consider the larger reason this is important: our society cannot continue to develop around automobile dependency and be sustainable at the same time. The more trolling they get the more eyes they have on their ads. Reasoned articles don’t generate revenue. Maybe they should throw in some twerking.